I know a lot of people who rush to office with just bread-omelette for breakfast as they don't find time to make anything else. For those who want a change from their regular choice of breakfast, I would like to share my wife's recipe that is quick, delicious and healthy. Heat a small kadhai, add oil, splutter mustard seeds, add curry leaves, onion, ginger and green chillies. Sauté till onion is translucent, switch off and allow to cool. In a vessel, add ragi, curd, salt, mix thoroughly. Add water to attain slightly flowing consistency (thinner than regular dosa batter). Check salt and adjust if required. To this add onion mixture and mix thoroughly. 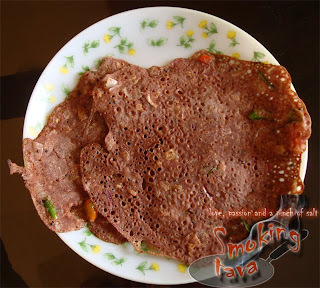 Heat dosa tava on high flame, pour the ragi dosa batter starting from the outer edge towards the center in a circular fashion (do not spread the batter like you do with regular dosa) to attain dosa shape (like in the picture above). Cook on reduced flame. Flip the dosa to cook on both sides. You may add a little oil to the dosa to make it crisp. Enjoy this quick, easy and healthy ragi dosa as is or with coconut chutney.